Available from Sunday 1 June, 2003 at 10:00am. The celebrated singer who lives a life of singing and love kills herself because of love. The New National Theatre Tokyo (NNTT) provides opera classes every year to enable high school students to appreciate the wonderful features of opera. 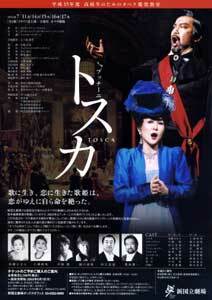 In 2003, NNTT will perform Tosca, one of the most important works of Giacomo Puccini, for the class. With its setting laid in a real place in Rome, Tosca focuses on the tragic love between the celebrated singer Tosca and the young artist Cavaradossi and portrays the hero and heroine at the mercy of their fate with impressive famous melodies. NNTT will present this operatic masterpiece, earnestly wishing that this will be appreciated especially by students who will see an opera for the first time. NNTT hopes that the high school students will take this opportunity to experience opera.